for the sake of a few billions more. Think again, you who think yourselves gods! Think again, you who think you are above the law. We smile in gleeful anticipation of that day. 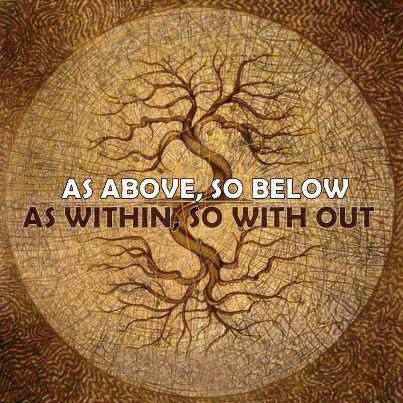 “As above, So Below” is a saying in Wicca. This phrase comes from the beginning of The Emerald Tablet and embraces the entire system of traditional and modern magic which was inscribed upon the tablet in cryptic wording by Hermes Trismegistus. The significance of this phrase is that it is believed to hold the key to all mysteries. All systems of magic are claimed to function by this formula. “‘That which is above is the same as that which is below’…Macrocosmos is the same as microcosmos. The universe is the same as the God and Goddess, The God and Goddess is the same as man, man is the same as the cell, the cell is the same as the atom, the atom is the same as…and so on, ad infinitum. “As within, so without” is like the saying As you sow, so shall you reap. 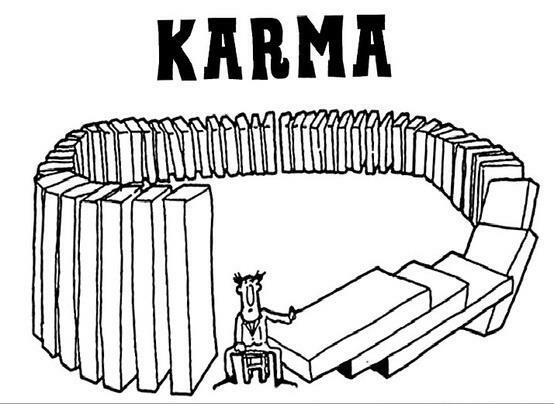 This is also known as the Law of Cause and Effect or Karma. Whatever we put out in the Universe is what comes back to us. If what we want is happiness, peace, friendship, love…Then we should BE happy, peaceful, loving, a friend. 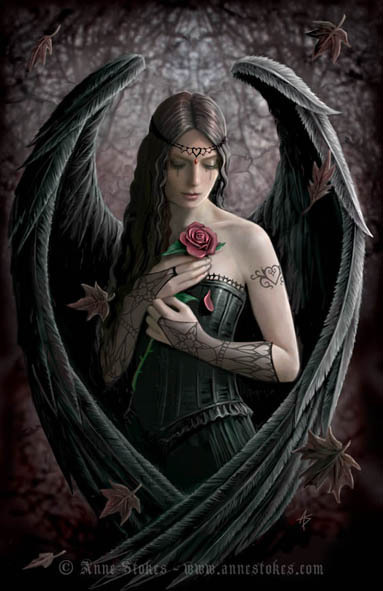 Negative energy sent out to others will come back to you. No, at the risk of annoying you, I shall never relent in my praise of Marlo Morgan’s book: Mutant Message Down Under. Among the many Aboriginal customs she describes there, is one where people change their names, whenever they themselves feel that they have learned an important life lesson, which therefore makes them better human beings. To honour this custom I have decided that I shall henceforth be known as Mister Big Child, the king-less jester to a court of none, but you can call me MBC for short. I realise that I am utterly human and my faults are still legion, but my childlike wonder is still undiminished. Where I thought I had lost the capability to rejoice in the simple things that life so generously provides us with, I had merely misplaced it. Reading the above-mentioned book has restored my belief completely. My faith in the existence of magic has been revitalized and I am bubbling over with glee, simply because I am alive. I had lost sight of the prime directive of magic: “When you ask, you shall receive what is correct for you and for the good of all living beings.” In other words, you get what you need, but not necessarily what you want, because it must be for the greater good. Karma is particular about that! Ladies and gentlemen, I have personally lived and breathed magic, during my last years on the streets in Spain. It took a harsh school and some rather strange encounters to get me there, but I did it and I was never without what I really needed. I shall reveal to you some of the methods that I used, so that you may try them out for yourselves. 1. 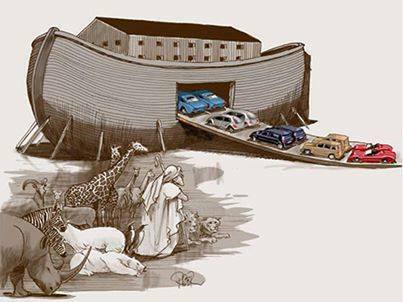 Ask and ye shall receive (, under the condition that you really need it!) You can ask out loud or silently, but it works even better if you visualise it and send it up to Karma, for her to deliver. However…, it is extremely important that you let go of it completely, because if you keep the desire, then there is no room for the real thing to materialise. 2. Be specific and for heaven’s sake be careful with the wording! Someone asked for an open heart, meaning empathy and such, but got surgery instead. 3. Have complete and utter faith. 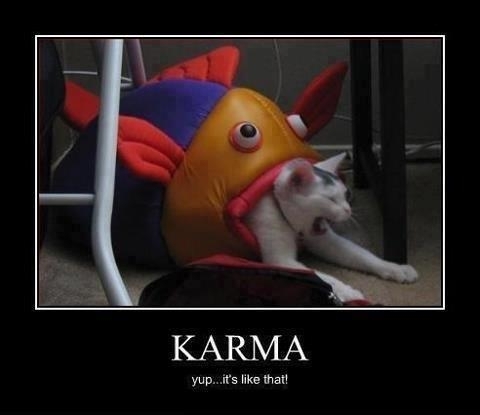 In fact, thank Karma or your god for what you are about to receive, before you get it, instead of afterwards. Even though giving thanks twice can never hurt. Many were the times that I worried, only to mentally kick myself afterwards for having doubted. It was only after I told myself to stop worrying, that Karma obliged. 4. Always stay positive. The more you fret, the more trouble you attract, by force of this negativity. The more upbeat you are, the more good things come to you. 5. Do not ask for luxury, for you do not ‘need’ it. Karma is not the lottery! You will not get it, period. 7. Constantly re-evaluate your situation and ask yourself what is important for you and for the good of all. Thus far my humble contribution in the teachings of magic. By the way, by no means did I invent these. They came my way through sometimes unorthodox channels, from being far more enlightened than I.
I will just elaborate on this last bit. 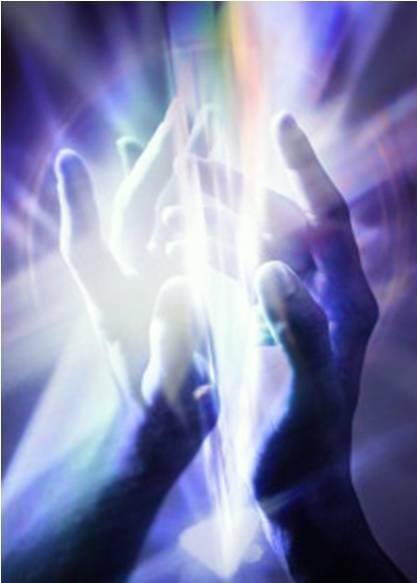 When you are open to magic, spirituality, call it what you will, then you are emitting on a certain frequency and the answers will come to you through any and all mediums at the disposal of Karma or your God. It is important to be receptive and never to give a second thought to the cover of the book, person, movie, etcetera that is sent your way. A last severe admonishment: Do not under any circumstance wish somebody harm, for it will come back at you a hundredfold!!! How to Send Karmic Thanks and Blessings. it is not the method, it is the faith in whatever you believe.. Either think of the person you are sending to, or while looking at a picture of them. Your deeds are pure and free from greed. such devotion is really rare. May you be blessed by those above. And repay you for the things you do. that all good things shall come your way! Or placed upon us as any curse. From The secret to humor is surprise. This House of Velvet Stars. safeguards one from all dangers. for those who bear the sign. shalt dig thine owne grave. Yohdi paid me a visit, telling me about a most peculiar trip he had made. 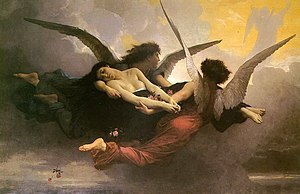 Apparently, he had been to the other plane, where souls roam, in the same space but on a different time and energy level. He had debated with himself whether to impart the knowledge he had gleaned there with us, because it might upset a significant part of humanity. But then he thought, they can always change if they so choose!